Mercury Sound & Lighting is a full production company and industry leader which equips major concerts, festivals, churches and corporate clients with the gear necessary to combine sound, lighting, video, staging, creativity and above all, excellence. About: We have been providing the best in sound, lighting, video, and staging for 7 years! Our prices very! Please call us for a great package price today! We have been providing the best in sound, lighting, video, and staging for 7 years!. Mercury Sound & Lighting is a full production company and industry leader which equips major concerts, festivals, churches and corporate clients with the gear necessary to combine sound, lighting, video, staging, creativity and above all, excellence. 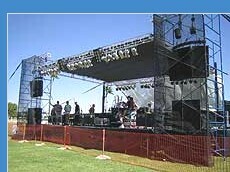 The vision of a Sound & Lighting company that was beyond the norm was initiated in 1998 when Dave Johnson saw a unique parallel between sound, lighting and imagination. In 2001, MSL became a full production company and industry leader by equipping major concerts, festivals, churches and corporate clients with the gear necessary to combine sound, lighting, video, staging, creativity and above all, excellence. 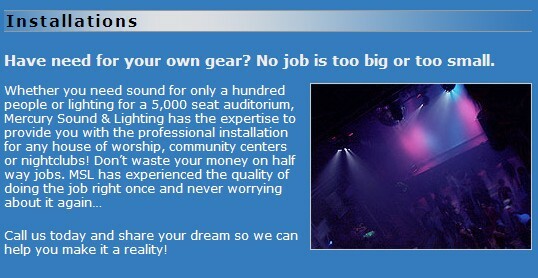 There are hundreds of sound & lighting companies in the U.S. The detail that separates us from them is the youthful and contemporary outlook that we have for every event! If your organization is looking for an average sound & lighting company, then perhaps MSL is not the best choice, but if you are looking to turn your at-bat into a grand slam then look no further! !